The world is ending and Moko was let out to write yet another article, this time about some crazy teens. Wait... what? That was two weeks ago, only the year this time? And no, actual teens are involved with the article, just something about spells? Okay then, read on for this weeks amazing edition of Cranial Insertion! Christmas is upon us and James is gifting everyone with the best thing possible... answers to their rules questions! Join us for the festivities in this weeks edition of Cranial Insertion! Hey, everyone it is that time again! Time for this weeks edition of Cranial Insertion. Join Carsten this week for some Modern musings! Join Eli as he takes a journey into the inner workings of the brain. Oh, yeah and he answers some rules questions along the way! Read on with this weeks exciting edition of Cranial Insertion! or, I Can Has Shockland? With the recent release of Commanders Arsenal we have some commanding rules questions for everyone! Join us in this weeks thrilling edition of Cranial Insertion! The illustrious and great Niv Mizzet will guide you through his factories and show off his most wondrous experiments. Oh, yeah, and he might just answer some rules questions too. Join us with this weeks homage to Izzet! Warning some things might explode. The party is heating up! This week is Rakdos week here on Cranial Insertion so unleash your thirst for rules knowledge and head on inside! Back in the City again! With the prereleases just finishing up and the release events coming up Ravnica is in full swing. Join us as we Return to Ravnica in this weeks Cranial Insertion! Round and round we go, like a record baby! Rotation season is in full swing as we spin ourselves dizzy on preexisting rules questions. So join james on his revolutionary journey around the CR in this weeks exciting Cranial Insertion! Leaves starting to fall from the trees and that can only mean one thing! Autumn is in the air, no new Magic sets, of course! Alas as we wait for the Return to Ravinca, Carsten takes us through some freshly fallen (in our inboxes) rules questions! Doing laundry has never been so much fun. Or mentally devastating. Join us as we travel the world. In the wake of the Magic World Cup, James takes us on a journey of rules questions! With the sun shining down it is hot, hot, hot! Just like this edition of Cranial Insertion, so join us inside with some mind melting rules questions! Welcome back to the Olympic Games, and this time we take you to the Magic Triathlon, this event consists of... wait, that is not a real event. Okay back to you Carsten with this weeks Cranial Insertion! It is quizzically wonderful, or is that wonderfully quizzical, what Moko can do with questions! Time to put down that eReader and check out this weeks Cranial Insertion! Read on for this weeks exciting article and test your knowledge! 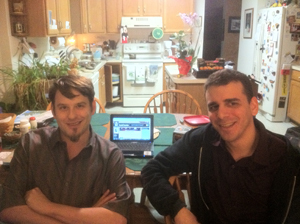 With the M13 prerelease just under our belts its that time for Eli to tackle all of those burning rules questions! It is an explosive celebration! Join James as we celebrate the 4th of July by liberating all those rules questions Cranial Insertion style! Is that a Deep-Sea Kraken on the horizon over there? Nope, that is just some Mystic Snakes on a Train. Read on as Eli gives a tribute to budget giant monster flicks, oh yeah, and answers rules questions too! 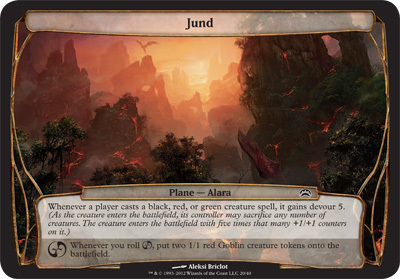 Back from his recent journey through the Second Sunrise of Planechase, Carsten takes us through the exciting interactions of the new release! Read on to find out what feel good rules questions await! Come on in and raise a cup along with James while he plays his vuvuzela and answers all your rules questions! It is Magic World Cup fever here at Cranial Insertion, read on! Don't you want me... to explain some rules? There definitely is a Fascination with rules going on here in this weeks extraordinary edition of Cranial Insertion! The Helvault has been shattered, Avacyn has been restored, and it's time once again to be touched by the better angels of our nature. Or, at least, by some questions! Since summertime is getting underway what better marriage than Cranial Insertion and Avacyn Restored? Find out what soulbonding adventures await, so grab a nice tall glass of iced demonade!? and read on with this weeks Cranial Insertion! Still waiting for Avacyn Restored? Want to know what is in the Hellvaults? Well, so do we! In the meantime join us once again in our pre-prerelease article partying with all of the usual rules questions you know and love! A box full of surprises and all those rules questions you know and love, in this edition of Cranial Insertion! Lots and lots of questions on Legacy Weapon in this exciting edition of, what was that? Legacy the format you say... Lots and lots of Legacy, the format, questions and nary a Legacy Weapon in this exciting edition of Cranial Insertion! Copper and wool, oh my! We have prepared an exciting anniversary article full of special metallic and cloth rules questions! Okay they are just normal rules questions, in this exciting edition of Cranial Insertion! It's time to lock up the house and turn out the lights, but not before we cross some mountainous elephants! Creatures undying all around us, what are we todo? Why, read this weeks Cranial Insertion, of course! This weeks edition with the standard compliment of zombies, humans, brains, and oh yeah, rules questions too! Unlucky Monday the 13th? This weeks article features heartfelt rules questions, in this our Valentine edition of Cranial Insertion! Little-known fact: Increasing Confusion's art was based off of our inbox. Moko is down there somewhere. What is that noise I hear!?! Oh, it is just some CCR playing while Eli answers some scary rules questions! Join us in this for this weeks edition of Cranial Insertion! Smacking Cultists for fun and profit! Chef Carsten is at it again with his New Years resolutions; including eating right, exercise and reading lots and lots of Cranial Insertion! Join us for this feast of rules questions! Watch out Tim, the bunny is back! Along with all the rules questions you can handle in this the second Cranial article of the new year! 52 More Weeks of Questions! New year, new rules questions, new article! What more could you ask for but 52 more weeks of Cranial Insertion! ?